It’s a simple message but one which is obviously not getting through to drivers. We see it every day and on every ride. Use of mobile phones while driving is simply epidemic. The latest figures from the Gardai show that – on average – more than 2,100 people a month are being issued with fixed penalty notices for using a mobile while driving. 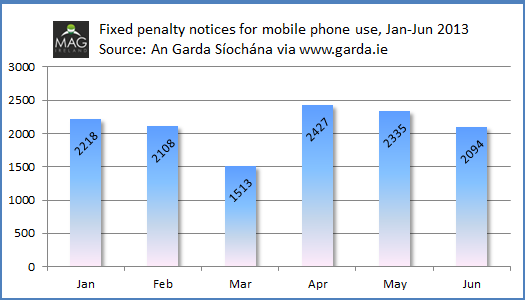 An average of over 2,100 fixed penalty notices issued per month for using a mobile phone while driving. Anecdotal evidence would tend to suggest that phone usage rates are much higher than the report shows, at least on the East coast. 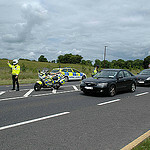 The sheer volume of fixed penalty notices issued suggests likewise, particularly given that enforcement requires direct intervention by Gardai who must stop the driver in question to issue the notice. We know that one of the most common motorcycle collisions is the dreaded “SMIDSY” (Sorry mate, I didn’t see you) where a driver pulls out on (or turns across the path of) an approaching motorcycle. For us as riders, the implications are crystal clear – Distracted driving is a significant contributor to motorcycle casualties. Precisely how significant is difficult to quantify, but RSA figures above suggest it may be as high as one in four collisions. What all the studies, reports and surveys are telling us is that distracted driving is a growing problem. The mobile phone of a decade ago was used only for calls and texts. Today’s smart phones provide a wide range of potential distractions from social networking and e-mail to games and instant messaging. This problem is simply not going away, and we as riders need to take account of that. Too many riders have been hurt, or worse, by the inattention of drivers focussed on their phones. Our message to drivers is a simple one.